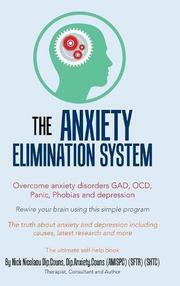 All we have to fear is fear itself according to this practical psychotherapeutic guide to working through anxiety. Nicolaou begins by recounting his own history of frequent, crippling panic attacks that assaulted him whether he was flying in a plane or lying comfortably in bed. After years of unhelpful treatments with anti-anxiety meds and bouts of paralyzing depression, he became a therapist and developed the nonpharmaceutical treatment program elaborated here. Drawing on cognitive behavioral therapy, he pegs anxiety disorders as purely mental phenomena in which our normal response to stress pathologically feeds on itself. The stress hormones adrenaline and cortisol, Nicolaou argues, produce physical symptoms of fear that are not harmful but can feel like a heart attack and make us think we are suffering from a serious disease; meanwhile, they suppress the brain’s rational circuitry and bring on morbid ruminations. (In the author’s case, he became obsessed with researching anxiety disorders on the internet, which only fueled his worries.) The result is a vicious circle in which dread of anxiety, panic, and depression becomes the driver of further anxiety, panic, and depression. Debut author Nicolaou outlines a six-step self-help plan for short-circuiting the downward spiral by redirecting the mind away from anxious anticipation and toward relaxing activities and reflections. The regimen includes hot showers, breathing exercises, meditation, and diet tips, but its heart is a set of self-talk scripts to repeat whenever anxiety mounts. (Sample inner monologue: “I’m not in any danger. These feelings started because I scared myself by something I thought.”) In prose that’s confident and reassuring, Nicolaou lays out his treatment and its underpinnings in brain science in a lucid way. Some psychiatrists may wince at his contempt for theories of biological causation and rejection of psychiatric meds and consider his very stripped-down version of cognitive therapy simplistic, but readers will find here a constructive, easy-to-follow path toward addressing psychological problems. A straightforward, hands-on approach to self-calming.